I’ve been conducting interviews for my upcoming report on the Future of Social Networks, and have spent time with many vendors that have started to mention the “Open Stack” (both Google and Plaxo mentioned this to me). As a web decision maker (I call you a web strategist) you need to be aware of emerging technologies and how they impact your strategy. The Open Stack (much like an application stack) is a set of technologies that allow for the passing, sharing of data across multiple containers and platforms, learn the details from the Plaxo guys. 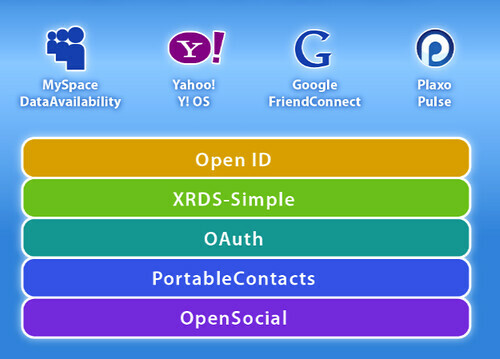 To be specific, the stack consists of OpenID, OAuth, OpenSocial, XRDS-Simple, and Portable Contacts. It’s a tendons between bones, it’s the sinew between muscles, it’s what I call “connective tissues”. If you’ve been watching the news, major platforms are adopting these technologies, most recently, the big giant Facebook (who is known for being more closed and proprietary than others) has joined the Open ID Foundation. Steve Kuhn took notes from a recent Web 2.0 event which explains why OpenStack and what the technologies do. Kris was at the same event and gives more details into how it works. Uncle Marc Canter, who flaked on my meeting with him, (he’ll say it was me who flaked, don’t believe him) thinks broader about the OpenMesh, in between painting his fence with architecture diagrams. So what’s my report going to say? I’m looking at the impact of these technologies and others looking 3-5 years out and how they impact brands, consumers, and the community. What kind of crazy things can happen? The act of friending could go away, registration pages could die, and corporate product pages may look more like wikis, yup, anything’s possible. I’ve already finished many of my interviews folks such as Facebook, MySpace, Twitter, RWW, Razorfish, Dell, Gigya, Intel, Meebo, Federated Media and others –and have found a few patterns. more to come soon.